Start at the Appalachian Mountain Club (AMC) Pinkham Notch Visitor Center right off of Route 16 just north of North Conway, NH and just south of the Wildcat Mountain Ski Area. From the parking lot, head directly behind the visitor center and begin ascending mostly west on the Tuckerman Ravine Trail. You’ll stay on the Tuckerman Ravine Trail for either 1.7 miles or 2.3 miles, depending on snow conditions at the time of your climb. The Tuckerman Ravine Trail portion of the route is mostly a standard hike rolling through tree cover, with a few steep sections mixed in. However, there are times when this 1.7- to 2.3-mile section can pose its own challenges. If significant snowfall has occurred in the day or days preceding your climb, travel in this section can involve slogging through deep snow, so snowshoes are advised. In late fall, early spring (or other various times), the trail can be largely iced over, making the use of traction gear (crampon, microspikes, etc.) a necessity. Where the route turns from here depends on the conditions, or more specifically the snow conditions. 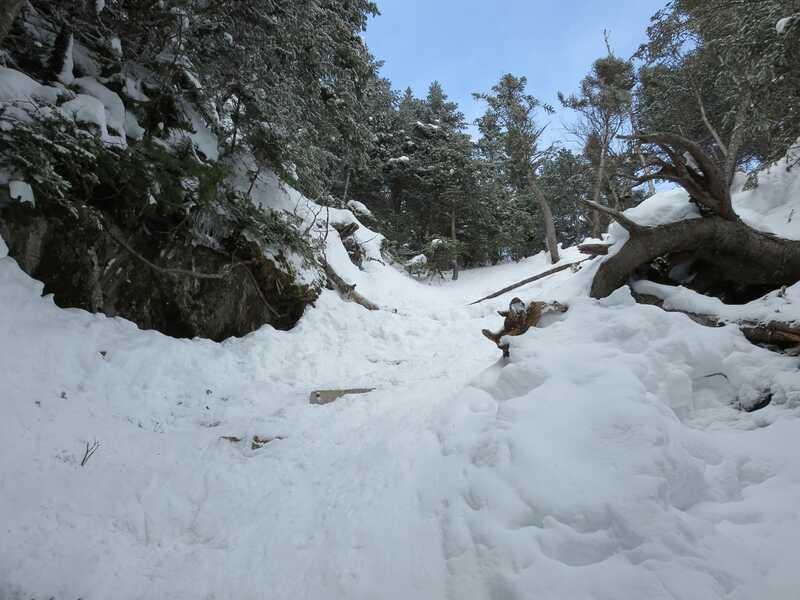 If enough snow has fallen, the Lion’s Head winter route will be open. If the amount of snowfall hasn’t been significant enough yet, the Lion Head Summer Route will be open. After hiking 2.3 miles from the visitor center, the trail will take a right turn onto the Lion Head Summer Route. The Summer Route ascends sharply, gaining about 1,200 feet in the first 0.5 mile up to Lion Head. Take the Summer Route up past tree line to Lion Head. A much more exposed – and therefore typically colder and windier – section awaits. 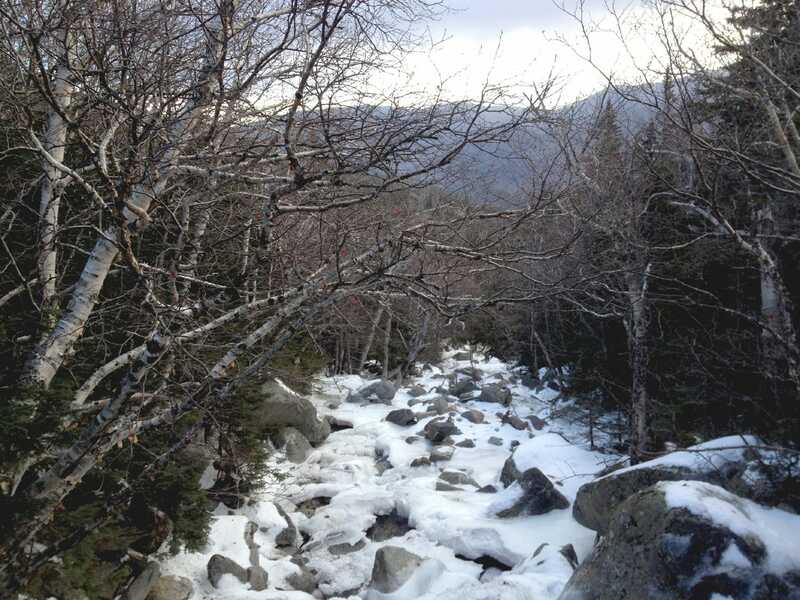 If there has been enough snow accumulation on the summer Lion Head trail, the Forest service will open of the Lion Head Winter Route, which shaves a little more than half of a mile (0.6 mile) from the Tuckerman Ravine Trail portion of the climb. The Lion Head Winter Route is opened to discourage climbers from ascending on the Lion Head Summer Route, which can bring serious avalanche danger if enough snowfall accumulation has occurred. Instead of hiking 2.3 miles on the Tuckerman Ravine Trail (see directly above), travel 1.7 miles and turn right at Huntington Ravine Fire Road. Take this road for about 500 feet to the start of the Lion Head Winter Route. This Winter Route is a steep ascent through wooded terrain and can often be challenging and awkward, depending on the conditions. Take this route up to the tree line, where it meets the more standard Summer Route described in the section above. Once reaching Lion Head (approximately 5,033 ft), continue following the cairned route mostly west (along with some sections of northwest travel) in what is a largely exposed section of the climb. Lion Head is known as one of the windiest places on Mount Washington (if not THE windiest), so portions of the trail are often completely snow-free regardless of how much has fallen elsewhere on the mountain. 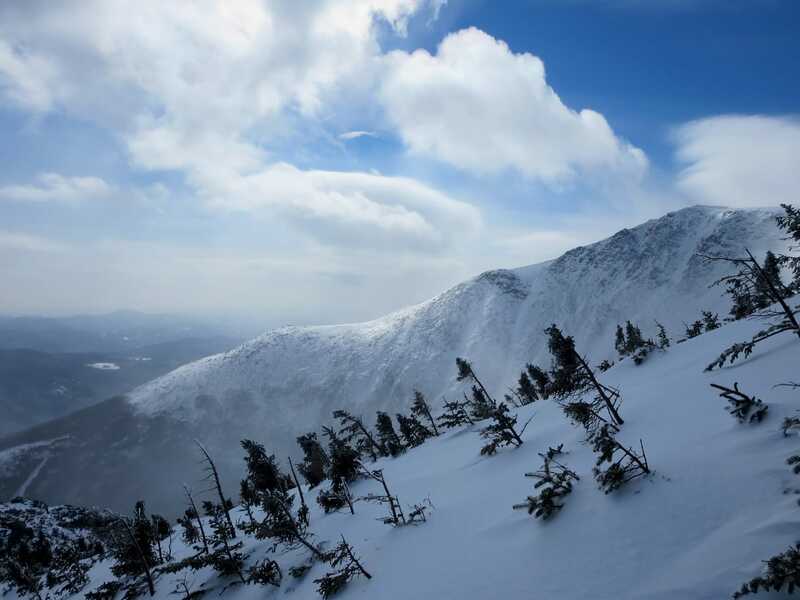 The route will eventually meet back up with the Tuckerman Ravine Trail at approximately 5,675 feet, at which point you’ll turn northward for the final leg of the climb. Now heading mostly northward, follow the cairned trail the final 600+ vertical feet in about 0.6 miles the summit. Visibility can often be poor in this final section, as the mountain’s notorious bad weather will often take center stage. Head over to the summit complex and sign the voluntary climbing register. You should be able to see my GPX track loaded on the map above. Get in touch if you want to use this for your own climb. Good post. 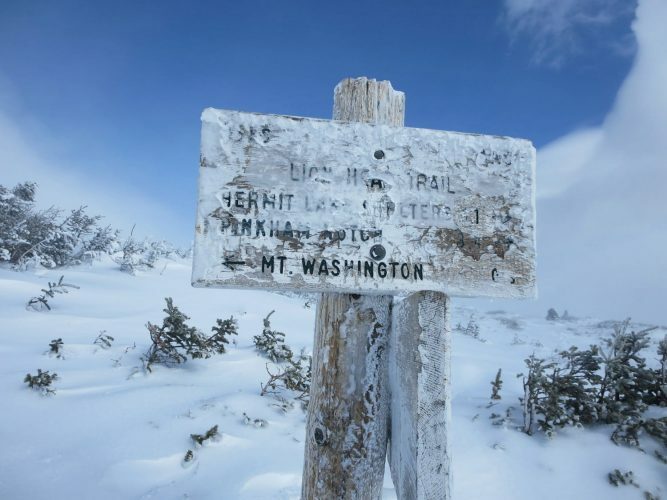 Can you send me your .gpx file for your Feb 2014 Mt Washington route via Lion’s Head winter route? Thanks! Sure thing, I’ll email it to you. Have you attempted the route before? Let me know how it goes! Thanks much! I think I was able to use your email form…also looking for the GPX route for my Suunto Ambit as a backup…thanks! Great write-up…much appreciated! Joshua: I just saw your email & I’ll send over the GPX. Lion Head is a great route, so I’m sure you’ll have a good time. Sounds like you’ve done your fair share of winter mountaineering, so you know the drill — pack wisely and prepare to use all layers! And don’t forget your ski goggles on Mount Washington. Sure thing–I’ll send over my most recent GPX. Can you send over your Lions Head Winter GPX file? I would so appreciate it! Can you please send me your lions jead winter GPX file? Hey Chris – Definitely, I’ll send it over.